This is the first post related to my participation in the forthcoming New Research Trajectories event, Contemporary Art of Walking. Curated by Alison Lloyd, it aims to explore wandering and journeying, mapping or the notion of getting lost as a practice / methodology through participant contributions, discussions and performances. Spatial and geographical metaphors are frequently employed in educational theory, particularly to describe domains of practice and knowledge. There is something instinctive about seeing how we orient our way through these domains as trajectories and pathways. For the purposes of the event, it’s not particularly important how effective these metaphors are per se, but rather, how usefully they may be understood by a non-specialist audience whilst exploring the landscape itself, and how they may create opportunities for participants to reflect and engage in discussion about their own practices. Etienne Wenger situates practice in specific contexts within particular social and physical environments. I’ve shown this video on here before, but it’s worth another look. 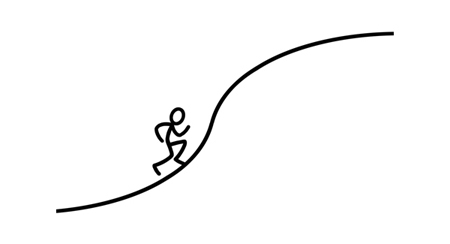 We can easily visualise a Community of Practice (CoP) as a hill, but taking the topographical analogy a bit further, mine has increasingly steep sides giving way to a relatively flat top. The trajectory described by participation in a CoP addresses not only skill and knowledge acquisition but also socialisation, as we become enculturated in the values, behaviours, and language related to the CoP. According to Wenger, the process of socialisation is at first legitimately peripheral but increases in engagement and complexity. So, it’s easy to get initially involved with a CoP – it’s a shallow climb to start with, fairly easy going, and the top doesn’t seem that far away – but gradually we realise it’s not so easy, as the terrain gets steeper and the climb gets tougher. We may think leaving a CoP is difficult, but it needn’t be. It’s the same terrain on the way down as it was up. All we need to do is jump right off. ** We might get a few bruises, but it’s quicker than the climb up. *Of course this analogy doesn’t accommodate the issue of multi-membership. As Wenger explains, we can belong to many CoPs simultaneously, or at least one or two dominant ones, and others peripherally. But that probably requires some better sketches! **In certain situations, we might not want to leave, but get pushed off! This entry was posted on Sunday, May 8th, 2011 at 2:40 pm and is filed under Posts. You can follow any responses to this entry through the RSS 2.0 feed. You can leave a response, or trackback from your own site. Interesting how this mirrors the adoption curve (Rogers) and the learning curve. 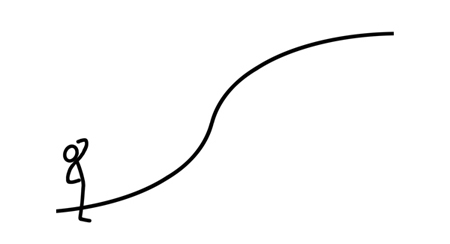 In marketing, the product life cycle is a curve which at the top (plateau) is the maturity phase and when it begins to drop off it is called decline. When a product is in decline, companies do something to restart (reformulate, relaunch) the product. However, some just let it ride in the “decline stage” as they don’t have to invest very much in it to maintain it as the status quo. Back to your analogy, some people are comfortable to stay within their own communities, geographic location, neighborhood until something prods them to explore. That trigger is what is educators should be looking for. Yes. It’s a recurrent shape in natural and human phenomena. 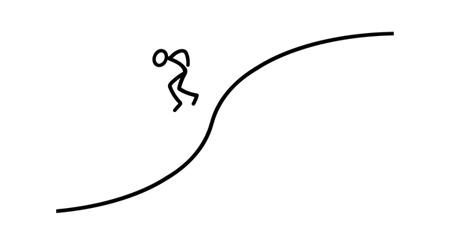 I’m interested in the ‘jumping off’ of a community of practice and the idea of unlearning. Here, I think the metaphor holds well. Skills and knowledge developed in a community of practice do not necessarily need to be unlearnt – they just fade over time through natural wastage. But the cultural norms and belief systems in which those skills and knowledge are contextualised – sometimes at fundamental epistemological levels – become ‘baggage’ when entering a new community of practice. Extra weight in your rucksack when climbing that new hill! 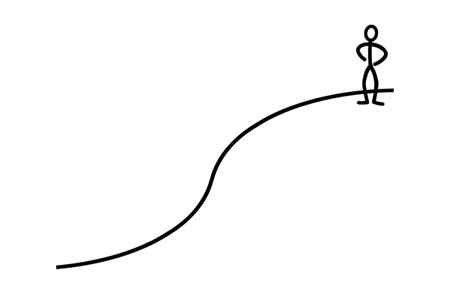 Taking the metaphore one step further and aligning related communities with intersecting curves suggests a progression of eased burden when moving from a community of novices, to practitioners, and then to experts. Patterns of behavior and thought could be modified (learned) and abandoned (unlearned) as one exits a community and progresses to another. The model sheds some light on tendancies for electronically mediated communities to go stale and be replaced by new electronic community spaces in a cycle of learning/unlearning and eased curves over time all guided by one’s sense of self. I’m wondering if scale is an issue here – in terms of how communities are defined and what is adopted as indicators of that definition – and how ‘close’ the multiple communities we engage in are. How are boundaries between them negotiated?